Managing OKRs at scale is not simple. This is one of the key problems Gtmhub solves. With the latest bulk management features – based on actual use cases – Gtmhub makes the process of planning and managing OKRs not only simpler, but also – enjoyable. The new bulk actions are available in all editions. You can easily find it through the Settings and actions drop down menu. In order to get there, navigate to: OKRs > Session > Objectives > Settings and actions. In this fast pace environment, things must happen at high speed. Reducing the manual touch and completing actions swiftly is crucial to stay on top of your game. And as organizations align themselves around business goals and priorities, very often objectives get reassigned between people – to ensure that no one has too much on their plate and can fully focus. That is why we have introduced bulk assigning and reassigning. If you've already used the tagging option and you have all the labels on their relevant place, that's awesome! But what will happen when a new quarter comes and all your finalized OKRs for it have to be tagged? Would you go and edit each objective one by one? Of course not! You'll use the bulk tagging action. It allows you to add new tags on the spot, assign tags to their Objectives or delete tags when no longer needed. This is how it goes. Another common use case is simply postponing OKRs for the next quarter. As we often say, OKRs are just as much about deciding what not to do as they are about deciding what to do. This use case is the reason why we’ve introduced bulk moving of objectives between planning sessions. 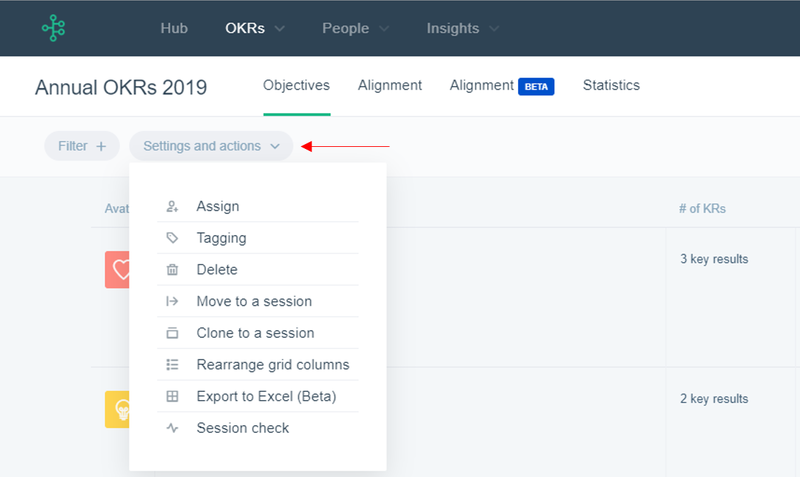 For this use case, we’ve introduced the ability to clone OKRs from one planning session into another. Many organizations choose a bottom-up approach with OKRs and foster employee engagement. In this scenario, employees are encouraged to define OKRs themselves and then teams collectively decide on which ones are to be pursued. The side effect of this approach is that many OKRs will not be used and need to be deleted. For this scenario, we’ve implemented a bulk delete action. NB! Note that it's irreversible one click action!